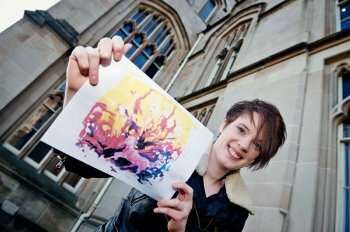 Digital artwork by a University of Ulster postgraduate student has been selected for publication in Images 35 ­ the ultimate jury-selected sourcebook for illustration in the UK and showcase for the best of British contemporary illustration. Eileen-Marie Emerson, who hails from Cushendall, County Antrim, is doing a Masters degree in Design Communication at the University's Magee campus. There are eight categories in Images 35: Advertising, Books, Children's Books, Design, Editorial, New Media, Self-Promotion and New Talent. Eileen-Marie's entry selected for inclusion in the New Talent category was developed from computer manipulated mark making in pastels, inks and watercolours. Eileen-Marie, who graduated from the University of Ulster in 2010 with a degree in Multimedia and Computing Design is now working as a freelance illustrator, while studying her Masters of Design. She says having her work included in such a prestigious publication is an excellent opportunity to get her work known by other professionals working in illustration. Images 35 is distributed to over 4000 specially targeted commissioners in the UK and Europe and the artwork included in the publication is sold worldwide on www.theaoi.com - the Association of Illustrators' website. The illustrations included in the publication were selected from entries for the Association of Illustrator's Images competition. The AOI competition is considered by the industry to be the most comprehensive and prestigious illustration awards competitions in the UK. Less than one third of the total images submitted for the competition were selected for publication in the 2011 edition of the glossy annual. The AOI was established in 1973 to advance and protect illustrator's rights and encourage professional standards. It is a non-profit making trade association dedicated to its members' professional interests and the promotion of illustration.